Balcurvie Riding School – A wide range of horses and ponies are available for lessons and hacks, catering for beginners to advanced riders. Balcurvie Riding School Running for Over 20 Years Located in Windygates, Fife. The riding school presently has a selection of lovely horses, and ponies. Our well-schooled horses allow our customers to enjoy hacking, or riding out. We have a variety of rides to cater for all standards. So whatever your experience you are always welcome. The minimum age is 4 years old, and there is no upper limit. We do have a weight limit of 15 stones. Balcurvie Riding School has fantastic hacking! Our clients hack up our Bridleway which is directly onto Fife’s open countryside. Our riding school have fantastic hacking for all which leads directly into Fife’s open countryside. 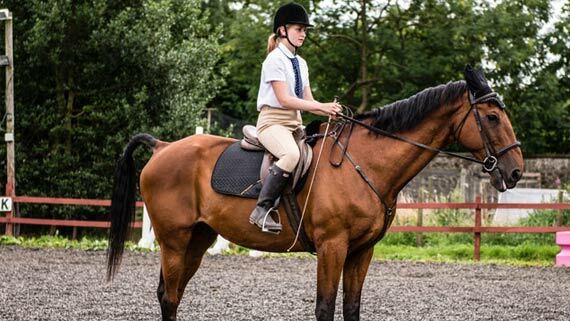 We have a variety of riding lessons and instructors to cater for all standards & your experience. We hold many equestrian events during the year for all ages, that help raise money for local charities. We are located in Balcurvie, Windygates, Fife Scotland. You can click below the link below for a map. It isn’t difficult! Just Contact us for lessons! We’ll teach you how to ride and improve your riding! Want to learn to ride or returning from a break then we can help with friendly experienced instructors. Just contact us to discuss lessons and get you in the saddle. The riding school presently has a selection of lovely horses, and ponies. Our well-schooled horses allow our customers to enjoy hacking.